Rebecca Anne (Becky) Edwards was born in Bristol on 18th of September 1978. Aged 2 Becky moved to Frome with her parents and attended St. John’s Primary School, Oakfield Middle School, and Frome College. 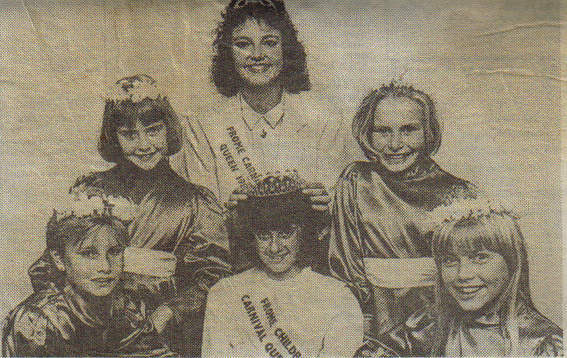 Aged 11 Becky was crowned Frome (junior) Carnival Queen. A child actress until aged 16. 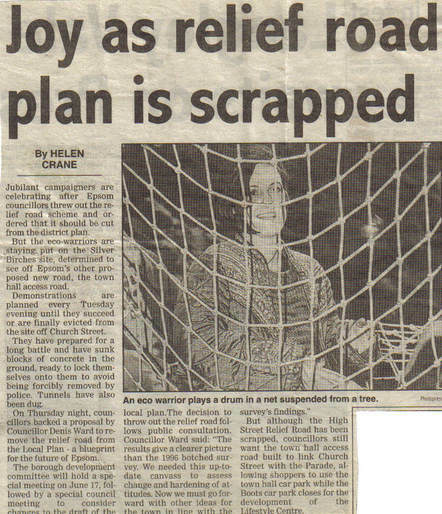 Becky attended Bath Performing Arts College and at 17 became an eco-warrior and learned to drum whilst saving trees at road protest sites. Her outstanding drumming skills soon earned her the name Dizzi Drummer. While in London she discovered the magical melodies of the Hammered Dulcimer and set about the task of teaching herself to play this wonderful instrument. “As a recording artist my musical inspiration was initially solely rhythmic based. Now I have found the Hammered Dulcimer I can introduce melody into my rhythmic world. Dizzi returned to Frome to set up her own record company Ezelove Records. During this time she performed as a Percussionist and Dulcimer player in many types of event from weddings, seminars and clubs to recording sessions for film and radio. Dizzi has been performing and recording her own music since 1997. She has worked successfully with many genres of music across the spectrum, appearing numerous times at Glastonbury Festival & Edinburgh Fringe. 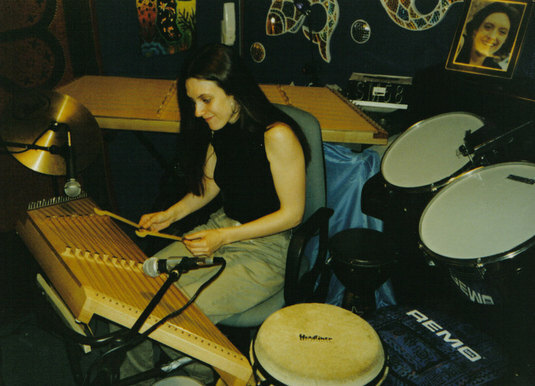 History of Rebecca Anne Edwards "Dizzi"
Began writing her Dulcimer compositions as sheet music to be released in a book. Uploaded her 80th Dulcimer video to youtube and her most popular performance video hit 165,000 views. Began selling Hammered Dulcimers on her website. Its purpose to promote the instrument and provide free teaching videos to help people learn how to play. Purchased 6 small beginners Dulcimers to sell to students. Discovered the Hang steel drum and began learning to play it. 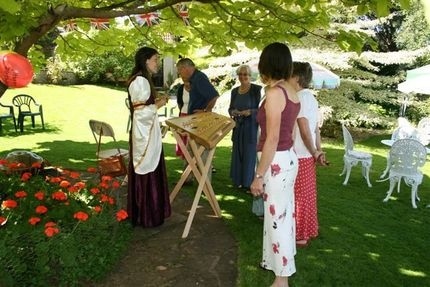 Started Hosting Live Internet acoustic events at Her own Venue "The Batch"
Performed as a Dulcimer player at various Weddings, Costumed events and Seminars. Completed 1st 11-track album "Ezelove Communications" written, performed and recorded as a "One Woman Project" using Percussion, Hammered Dulcimer, Penny Whistle, Vocals and recorded with modern digital technology. Performed on Monday nights (Live Night) as resident hand-drummer at The Kabaret Club in Soho London. Regular performances at Boujis and Rouge working with many diverse musicians including Nizlopi, Lazenby, Jem and Peyton. (These are private clubs where the various record labels ‘try out’ new acts). Performed at Pacha and El-Divino, in Ibiza with Peyton for his Single "Higher Place" released by Hed Kandi. Completed a 1-year course at Lewisham Institute of Music Technology: Foundation in Music Technology. Producing and Recording Computer Generated Music. Trained as a Jewellery technician by acclaimed designer Rainbow Hart making Swarovski Crystal necklaces for celebrities and worked on designs that were worn by artists at the Mobo and Brit Awards. Discovered the Hammered Dulcimer and began learning to play it. 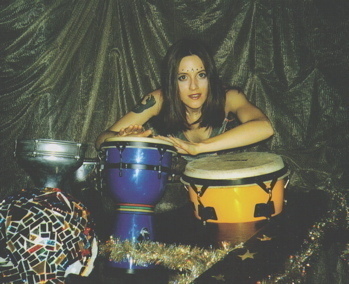 Moved to London and began drumming each week with various DJ’s at The Drome, London Bridge (underground dance club). A tour followed with appearances at Heaven, Open, The Talk of London, and Tyson Street Studios. Recorded with Award Winning Russian Dance Producer ‘Inner Voice’ providing live organic hand-drum samples for World Trance Music. Lead percussionist at The Globe Theatre and Southwark Cathedral for performances of ‘The Southwark Mysteries’ written by John Constable. Trained as a mosaic artist working for Alex Thynne, nephew of Lord Bath. Worked on 18ft Sun Mosaic for the ceiling in the Children's playroom and 24ft Water mosaic on the ceiling in the Children's Sauna room in Lord Bath's Quarters at Longleat House, Somerset. Went to live at Fairmile road protest camp, then Newbury Road protest. Lived in a tree house for 6 months. During this time bought first hand drum and became well known for individual style as a percussionist and soon earned the name Dizzi Drummer. 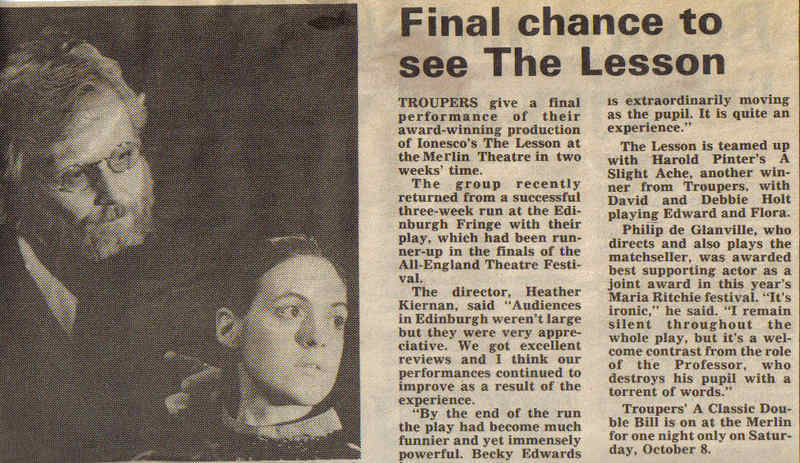 Played the Pupil in Eugene Ionesco's "The Lesson" came runner up in the English finals of the Best One act Play competition. First performance as a professional actress as a rat and a child in Orchard Theatre Company’s adaptation of "The Pied Piper"
First performance in a Pantomime at Frome Merlin Theatre as "A Water Baby"
First performance on stage in School play as "A Christmas Elf"